An increased man-made radiation exposure-risk from the use of high-dose imaging modalities such as computed tomography and angiographic suites is now being observed in many health-care centers with over 3.6 million diagnostic examinations performed annually worldwide. , Interventional procedures are performed by cardiologists, radiologists, endovascular surgeons, operation theater staff, etc., due to the well-known benefits in medicine. However, it is crucial for the referring clinician and the interventionalist (radiologist/cardiologist/clinician in the operation theater) to assess the potential benefit-risk ratio for various interventional procedures as some of the procedures involve a high radiation exposure due to prolonged fluoroscopic screening. All interventional cardiological procedures are invariably performed using dedicated fluoroscopy and angiography suites equipped with either image intensifier (II)-based or flat panel detector (FPD)-based systems. The II-based systems have been used for fluoroscopy for more than two decades. On the other hand, the FPD-based systems for medical imaging emerged in the 1990s initially for two-dimensional (2D) projection X-ray image, and subsequently for a "real-time" fluoroscopy sequence. Interventional angiography suites equipped with II or FPD have the potential to impart high radiation doses to patients if optimization strategies are not well-implemented. Stringent optimization involves orientation of staff, consistent restriction of frame rates during image acquisition, using low dose settings, judicious use of magnification, etc. It is also necessary to understand the potential risks due to radiation from different interventional procedures. For this reason, it is necessary that one should be knowledgeable in the magnitude of radiation dose associated with each intervention. This can be achieved by measuring real-time doses using devices such as a dose area product (DAP) meter. Most of the newer angiography machines are equipped with a DAP meter fitted on the collimator assembly of the machine. DAP is particularly a useful method for assessing and comparing the radiation dose from screening procedures and acts as a surrogate for radiation risk. , Entrance surface dose (ESD) is also used for measuring radiation doses. From the dose descriptors, it is possible to estimate organ doses as well as effective doses for each procedure. Radiation doses from interventional procedures have been widely reported in literature, with more emphasis on doses from II-based systems. However, there are only a few reports on radiation doses from FPD systems as it may be a transition period from II to FPD for most of the interventional users. Some patient and phantom-based studies reported in literature state that doses from FPD are higher than II systems. ,,, Few other studies report that radiation doses from FPD are lower than II systems. ,, In comparing conventional and digital systems, very few studies are found in literature and these are contradictory. Hence, it is not clear whether FPD imparts lower radiation dose than II and whether there would still be a need to further optimize doses in the newer FPD systems. The recent digital modalities have shown improvement in dose optimization and noise reduction techniques. The purpose of this article is to review and compare radiation doses from II and FPD-based systems in interventional cardiology in a tertiary referral center that has introduced FPD system recently. It is anticipated that this information will be useful for those performing cardiological interventions and for those who are on a transition from II to FPD. The study was approved by the institutional review board (IRB No. 8805). Cardiovascular interventions were performed using two dedicated catheterization labs, each equipped with Philips Allura FD10 flat panel system (Netherlands). The dose area product (DAP) values for Coronary Angiography (CAG, n = 222) and Percutaneous Transluminal Coronary Angioplasty (PTCA, n = 75) procedures performed during a one year period 2012-2013 were prospectively recorded using a built-in calibrated DAP meter (transmission ionization chamber). The PTCA procedure was invariably performed by a senior interventionalist assisted by two junior cardiologists, while the CAG was performed either by the senior interventionalist or by junior cardiologists. For a similar comparison of clinical protocols adopted in the institution, DAP values from CAG and PTCA performed using Philips Integris H3000 and H5000 II-based systems (Netherlands) reported earlier , were compared to those from FPD system currently studied. All the X-ray systems were on periodic QA programs and conformed to the manufacturer's specifications. The II and FPD systems had low-, normal-, and high-dose settings, respectively, for fluoroscopy. These machines incorporated a total filtration of 2.5 mmAl with possibility of selecting spectral filters such as 0.1 mm, 0.2 mm, 0.4 mm Cu for dose reduction. During the course of the study, low dose setting with 0.4 mm Cu filter was invariably selected during fluoroscopy. In the earlier work using II-based system, a 23-cm image intensifier format (IIF) was used during fluoroscopic screening in CAG and PTCA procedures for tracing the path of the catheter from the region of arterial puncture and to the screening of the cardiac valve region. A 17-cm IIF was used for the oblique, caudal, cranial, and lateral projections delineating the coronary anatomy. In the FPD system, 25 cm fluoro format was used during screening and 20 cm was used for other projections to delineate coronary anatomy. A transition from II to FPD system for a catheterization lab would require adequate justification in terms of radiation dose, image quality, maintenance, and investment. It has been reported that the FPDs designed specifically for fluoroscopic purposes provide superior image quality and dose efficiency compared to the II systems, except at the lowest fluoroscopic dose levels. Prieto et al., reports that even after upgrading to the FPD from II, significant increase in patient doses were observed though the fluoroscopic time and number of images remaining the same in both cases during the initial transition period. As only a few studies on radiation doses are available for FPD systems; more work is required on optimization strategies in the FPD systems. [Table 2] and [Table 3] shows DAP values for CAG and PTCA procedures from various studies in literature. 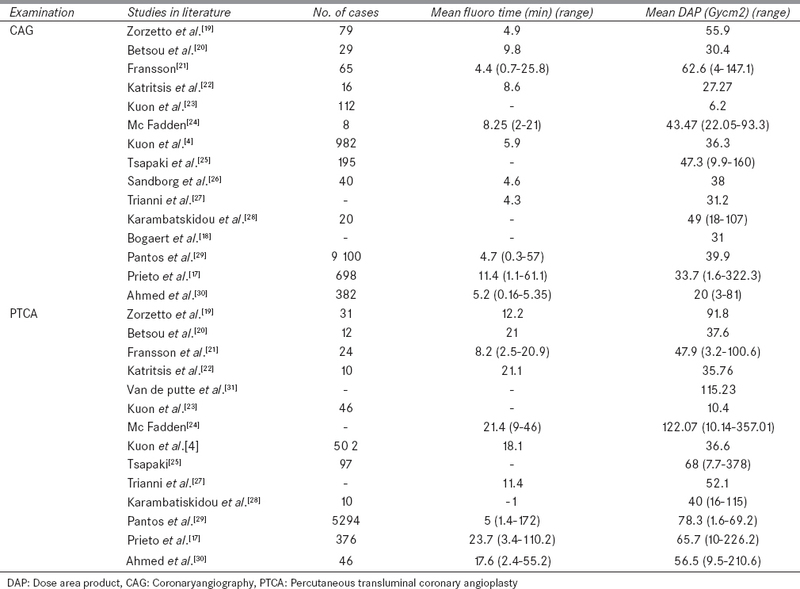 The arithmetic mean DAP and fluoroscopic time duration using II system as reported in literature was 39 Gycm 2 for 6.6 min and 61.2 Gycm 2 for 17 min for CAG and PTCA respectively [Table 2]. With the use of FPD, mean DAP and fluoroscopic time duration were 28.4 Gycm 2 for 7 min and 61 Gycm 2 for 18.05 min for CAG and PTCA, respectively [Table 3]. From [Table 2] and [Table 3], radiation doses from FPD were significantly low for CAG but were similar for PTCA when compared to II systems. It should be noted that time duration for CAG and PTCA was not available for some reported studies in [Table 2] and [Table 3]. Wide variation of doses is observed from these studies which may be attributed to the angiographic system used, time duration of the procedure and work environment. Doses of the order of 492 Gycm 2 were recorded in PTCA procedure from FPD system which was higher than the II systems. Chida et al., conducted studies from various II and FPD system and the average entrance doses of cine angiography and fluoroscopy in FPD systems were not significantly different. Though FPDs possess good detective quantum efficiency, they did not inherently reduce the radiation dose. Jensen et al., observed that patient doses from FPD were lower than II systems; however, the eye lens doses for radiologists were higher in FPD than in II due to the use of high filtration and recruitment of high tube potentials. In our study, high tube potentials were recruited when low dose settings involving high filtration were selected, which may have the potential to increase staff doses. This is a preliminary study as the institution where the study was conducted recently moved from II to FPD-based systems. Though radiation doses for cardiological interventions from FPD were similar to the II-based system achieved after optimization, the advantages of FPD in terms of good image uniformity, improved patient imaging accessibility due to smaller size, absence of geometric distortion/veiling glare or vignetting make the FPD superior to the II systems. To achieve improved patient dose reduction, it is advisable to strictly adhere to low dose protocols with high filtration in FPD systems. In addition, more attention for staff doses is warranted especially for interventionalists when this stringent patient dose reduction is employed. It is recommended to follow stringent dose reduction strategies right from the period of initial installation when there is a transition from II to FPD systems. Further studies are required to develop dose optimization in FPD, though use of high filtration is already in place. Authors would like to thank the Atomic Energy Regulatory Board of India for its financial assistance for the project. United Nations Scientific Committee on the Effects of Atomic Radiation. Sources and effects of ionizing radiation: United Nations Scientific Committee on the Effect of Atomic Radiation (UNSCEAR) report to the General Assembly, with scientific annexes. Vol 1. New York: United Nations; 2008. Mettler FA Jr, Huda W, Yoshizumi TT, Mahesh M. Effective doses in radiology and diagnostic nuclear medicine: A catalog. Radiology 2008;248:254-63. Seibert JA. Flat-panel detectors: How much better are they? Pediatr Radiol 2006;36(Suppl 2):173-81. Kuon E, Glaser C, Dahm JB. Effective techniques for reduction of radiation dosage to patients undergoing invasive cardiac procedures. Br J Radiol 2003;76:406-13. Vijayalakshmi K, Kelly D, Chapple CL, Williams D, Wright R, Stewart MJ, et al. Cardiac catheterisation: Radiation doses and lifetime risk of malignancy. Heart 2007;93:370-1. Broadhead DA, Chapple CL, Faulkner K. The impact of digital imaging on patient doses during barium studies. Br J Radiol 1995;68:992-6. Ruiz-Cruces R, Pérez-Martínez M, Martín-Palanca A, Flores A, Cristófol J, Martínez-Morillo M, et al. Patient dose in radiologically guided interventional vascular procedures: Conventional versus digital systems. Radiology 1997;205:385-93. Prasan AM, Ison G, Rees DM. Radiation exposure during elective coronary angioplasty: The effect of flat-panel detection. Heart Lung Circ 2008;17:215-9. Wiesinger B, Stütz A, Schmehl J, Claussen CD, Wiskirchen J. Comparison of digital flat-panel detector and conventional angiography machines: Evaluation of stent detection rates, visibility scores, and dose-area products. AJR Am J Roentgenol 2012;198:946-54. Chida K, Inaba Y, Saito H, Ishibashi T, Takahashi S, Kohzuki M, et al. Radiation dose of interventional radiology system using a flat-panel detector. AJR Am J Roentgenol 2009;193:1680-5. Jensen K, Zangani L, Martinsen AC, Sandbæk G. Changes in dose-area product, entrance surface dose and lens dose to the radiologist in a vascular interventional laboratory when an old X-ray system is exchanged with a new system. Cardiovasc Intervent Radiol 2011;34:717-22. Miraglia R, Maruzzelli L, Tuzzolino F, Indovina PL, Luca A. Radiation exposure in biliary procedures performed to manage anastomotic strictures in pediatric liver transplant recipients: Comparison between radiation exposure levels using an image intensifier and a flat-panel detector-based system. Cardiovasc Intervent Radiol 2013;36:1670-6. Tsapaki V, Kottou S, Kollaros N, Dafnomili P, Koutelou M, Vano E, et al. Comparison of a conventional and a flat-panel digital system in interventional cardiology procedures. Br J Radiol 2004;77:562-7. Dekker LR, van der Voort PH, Simmers TA, Verbeek XA, Bullens RW, Veer MV, et al. New image processing and noise reduction technology allows reduction of radiation exposure in complex electrophysiologic interventions while maintaining optimal image quality: A randomized clinical trial. Heart Rhythm 2013;10:1678-82. Livingstone RS, Chandy S, Peace TB, George PV, John B, Pati P. Audit of radiation dose to patients during coronary angiography. Indian J Med Sci 2007;61:83-90. Livingstone RS, Timothy Peace BS, Chandy S, George PV, Pati P. Optimization and audit of radiation dose during percutaneous transluminal coronary angioplasty. J Med Phys 2007;32:145-9. Prieto C, Vano E, Fernández JM, Martínez D, Sánchez R. Increases in patient doses need to be avoided when upgrading interventional cardiology systems to flat detectors. Radiat Prot Dosimetry 2011;147:83-5. Bogaert E, Bacher K, Lapere R, Thierens H. Does digital flat detector technology tip the scale towards better image quality or reduced patient dose in interventional cardiology? Eur J Radiol 2009;72:348-53. Zorzetto M, Bernardi G, Morocutti G, Fontanelli A. Radiation exposure to patients and operators during diagnostic catheterization and coronary angioplasty. Cathet Cardiovasc Diagn 1997;40:348-51. Betsou S, Efstathopoulos EP, Katritsis D, Faulkner K, Panayiotakis G. Patient radiation doses during cardiac catheterization procedures. Br J Radiol 1998;71:634-9. Fransson SG, Persliden J. Patient radiation exposure during coronary angiography and intervention. Acta Radiol 2000;41:142-4. Katritsis D, Efstathopoulos E, Betsou S, Korovesis S, Faulkner K, Panayiotakis G, et al. Radiation exposure of patients and coronary arteries in the stent era: A prospective study. Catheter Cardiovasc Interv 2000;51:259-64. Kuon E, Schmitt M, Dahm JB. Significant reduction of radiation exposure to operator and staff during cardiac interventions by analysis of radiation leakage and improved lead shielding. Am J Cardiol 2002;89:44-9. McFadden SL, Mooney RB, Shepherd PH. X-ray dose and associated risks from radiofrequency catheter ablation procedures. Br J Radiol 2002;75:253-65. Tsapaki V, Kottou S, Vano E, Faulkner K, Giannouleas J, Padovani R, et al. Patient dose values in a dedicated Greek cardiac centre. Br J Radiol 2003;76:726-30. Sandborg M, Fransson SG, Pettersson H. Evaluation of patient-absorbed doses during coronary angiography and intervention by femoral and radial artery access. Eur Radiol 2004;14:653-8. Trianni A, Bernardi G, Padovani R. Are new technologies always reducing patient doses in cardiac procedures? Radiat Prot Dosimetry 2005;117:97-101. Karambatsakidou A, Tornvall P, Saleh N, Chouliaras T, Löfberg PO, Fransson A. Skin dose alarm levels in cardiac angiography procedures: Is a single DAP value sufficient? Br J Radiol 2005;7:803-9. Pantos I, Patatoukas G, Katritsis DG, Efstathopoulos E. Patient radiation doses in interventional cardiology procedures. Curr Cardiol Rev 2009;5:1-11. Ahmed NA, Ibraheem SB, Habbani FI. Patient doses in interventional cardiology procedures in Sudan. Radiat Prot Dosimetry 2013;153:425-30.
van de Putte S, Verhaegen F, Taeymans Y, Thierens H. Correlation of patient skin doses in cardiac interventional radiology with dose-area product. Br J Radiol 2000;73:504-13. Stratis AI, Anthopoulos PL, Gavaliatsis IP, Ifantis GP, Salahas AI, Antonellis IP, et al. Patient dose in cardiac radiology. Hellenic J Cardiol 2009;50:17-25. Dragusin O, Breisch R, Bokou C, Beissel J. Does a flat panel detector reduce the patient radiation dose in interventional cardiology? Radiat Prot Dosimetry 2010;139:266-70. Tsapaki V, Christou A, Nikolaou N, Spanodimos S, Chinofoti I, Poulianitou A, et al. Radiation doses in a newly founded interventional cardiology department. Radiat Prot Dosimetry 2011;147:72-4. Tsapaki V, Kottou S, Kollaros N, Kyriakidis Z, Neofotistou V. Comparison of CCD and flat panel digital system in interventional cardiology laboratory. Radiat Prot Dosimetry 2005;117:93-6.